Boston University has been a hotspot for NHL priming in recent years and the 2018-19 roster has proven no different. The Terriers watched 2017-18 co-leading scorer, junior Jordan Greenway, sign in Minnesota a year ago before 2019 fourth-overall draft pick Brady Tkachuk became a late and somewhat unexpected departure as he jumped to the NHL after a strong freshman season. It made for another trying season in Beantown. Following the completion of the season, the Terriers’ depth took a hit at every position as six players signed entry-level contracts, joining fellow alumni including Jack Eichel, Clayton Keller, Charlie McAvoy, and New York Rangers head coach David Quinn, in the NHL. C | 37 GP, 17 G, 19 A, 36 pts. The 2019 Hockey East Freshman of the Year, Farabee led the Terriers in scoring as a freshman and finished third in the national rookie-scoring race. Once the 14th overall pick from 2018 (Philadelphia Flyers) got going, he wouldn’t stop. The 19-year-old was a surprise departure as a freshman, but his vision and two-way game prove his NHL future is certain. Farabee will get a chance to fine-tune his game and learn from the pros as he joins the AHL down the stretch. C | 37 GP, 11 G, 10 A, 21 pts. Bowers was drafted 28th overall in 2017 by the Ottawa Senators and was a key piece in the return for Matt Duchene for the Colorado Avalanche. The 19-year-old put pen to paper with the Avalanche, joining a young, rising organization. His sophomore year saw him take a step back offensively after a 32-point (17 G, 15 A) freshman season, but Bowers still finished fourth in team scoring. He’ll get a chance to further his development in the AHL ahead of 2019-20. LW | 27 GP, 10 G, 9 A, 19 pts. The undrafted 22-year-old showed natural progression during his four years at BU and even after some offensive struggles this year, his work ethic earned him an entry-level contract with the New York Islanders. The co-captain’s tenacity and leadership generated a lot of NHL interest last week before he signed with the Islanders. He’ll get a chance with the AHL’s Bridgeport Sound Tigers as they make a push for the playoffs. D | 38 GP, 7 G, 26 A, 33 pts. Fabbro quashed the speculation of his NHL future by signing with the Nashville Predators, who seemingly found another golden defenseman. The 17th overall pick in 2016 is still just 20 years old and has the abilities to be another defensive game changer. The two-way force has already joined the Predators’ stalwart blue line as the Stanley Cup contenders aim for a long spring. Fabbro will have to outshine some veterans to earn a regular spot, but he absolutely has the chance to make a difference. D | 30 GP, 8 G, 12 A, 20 pts. Selected 45th overall in 2016 by the Chicago Blackhawks, Krys almost signed with the ’Hawks last year, but chose to stay at BU to continue to develop his game. Now, he can be expected to earn a few looks as the season closes. The blue line has been the demise of a dynastic Chicago team over the past two seasons and Krys has the chance to be a part of its growth for the future. He has three assists in as many games with the AHL’s Rockford IceHogs since leaving BU. Goaltending has been the downfall of a strong Dallas Stars team in recent years, but with the resurgence of Ben Bishop, Oettinger has the chance to steadily work out the kinks before being a full-time piece. Drafted 26th overall in 2017, the 20-year-old was a force for the Terriers for three seasons and has a bright NHL future—in good time. He’s already joined the AHL’s Texas Stars, where he’ll get primed to fight for the starter’s role next season. Also departing, but currently unsigned in the NHL is senior Ryan Cloonan. Such a turnover could entice other players to seek transfers given the state of the team. 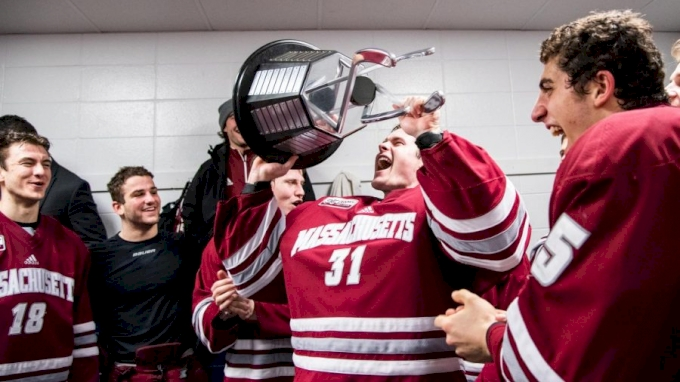 However, with six NHL draft picks still remaining on the current roster and the strong history of recruitment at BU, the program’s recent lull shouldn’t last long. Coach Albie O’Connell will need remain behind the bench for a third season and is poised to have a rather young team with plenty of questions from now until the fall. A plethora of talent remains on the roster and players will naturally take the next step, with a lot of ice time to be made up, surprises seem imminent.